"It is in part thanks to Picasso that humanity retains its moral compass even as violence rages in the mouths of elected hypocrites of all persuasions. The importance of Guernica as a testimony is extraordinary. Aesthetically challenging and ethically uncompromising, Guernica is for many the masterwork of the modernist master." By chance my first sight of Spain was the Basque town of Gernika. The plane flew in from the Atlantic on its way to Bilbao. Below was not only Spain but a town whose name has a resonance that made the sight of it more an act of reverence than of casual interest. Here was a place forever associated with an atrocity arbitrarily inflicted by Nazi aircraft for no reason except a show of terror and power. Whether or not there is a memorial in the town itself, there is in Madrid Picasso’s Guernica, an acknowledged masterpiece of world art, a guarantor that the massacre shall not be forgotten. By such art the unacceptable nature of such an act, wherever it occurs, is not forgotten. Such acts recur, as they have throughout the centuries. However often they occur we continue, as we should, to consider them unacceptable. We do not surrender to violence although violence perpetually threatens to overturn everything of value. And yet the world keeps turning. People hope to live their lives peaceably when there is peace. In the sunlight they cannot think too much about the dark side of life. ‘About suffering they were never wrong, the old masters’, Auden wrote. He was describing the indifference of the fishermen to the sight of Icarus falling on his abortive flight. Breughel depicted ordinary folk going about their tasks of survival as something very strange was happening close by but in a different world. Theirs was the world of necessary tasks. Icarus lived in a world of heroic myth. Perhaps the fishermen close by and the ploughman on the hill heard a splash. Perhaps they saw some shadow in the distance fall from the sky, only to disappear into legend and art. Suffering is a major theme in art. The depictions of the Crucifixion and the martyrdom of many saints recur constantly in Western art. The depictions are inescapable. Even in a secular culture we cannot evade this because pain itself is inescapable. Anaesthetic may relieve the symptoms of clinical pain, but in war and other forms of violence people, often wholly innocent, die in unrelieved agony. Many detainees in the world’s prisons are tortured even as the cause of human rights is debated among the nations. The metaphysic of suffering, so central to Christian belief, presents a challenge to the rational principles of humanism. Embracing pain as a transcendent mystery may seem perverse. To undergo agony as a means to understanding the meaning of things may not make sense in a material world of tasks. Tasks are to be endured for the necessary benefits and rewards they bring. There is no moral quality, it may seem, in the endurance itself. To see suffering as of spiritual value is a position that martyrs for a faith may adopt when prepared to endure the self-sacrifice of pain or death for the sake of the cause. But to make a virtue of suffering in itself risks abandonment of other qualities including common humanity. The reversal of moral values can be seen only as an aberration. The sight of Spanish Falangists raising the fascist salute to a statue of the crucified Christ burns into the memory for its chilling demonstration of how human values may be so distorted that evil is equated with good. To the Falangists the self-sacrifice of Christ is celebrated for its depiction of pain. It is good, in this aberrant world-view, to suffer. Or, rather, it is good to inflict suffering on others. That is their world-view. Such an approach makes a mockery of the faith it claims to confess. It makes a mockery of our common humanity, the essential truth that binds a fractious world. Easter 2017 saw the start of a major exhibition in Madrid surrounding Guernica. In addition to the work itself and the preliminary sketches, all on permanent display, other works were presented to give Guernica a context in terms of Picasso’s development. The work should not be seen in isolation as a masterpiece [although it undoubtedly is that]. 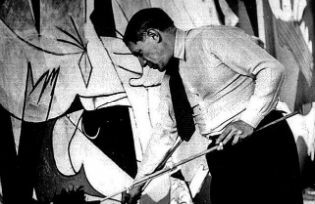 Guernica is shown as integral to the theme and style of many works created after 1918. One picture should not be seen in isolation when it is integral to the artist’s career as a whole. Picasso’s mind was centred on the presentation of conflict and its consequent agonies. He saw a violence at the heart of life in an uncertain century. This was implied if not stated at least as early as Les Demoiselles d’Avignon . The title is ironic: they are not young ladies; they are women of the streets. Those cruel faces staring out at an indifferent world present a moral order stripped of its naïve banalities. Superficially a depiction of street life, what Picasso reveals is an uncompromising truth about the world he saw. Flesh is for sale in the street. Humanity itself is for sale in the market place of materialism. The ordered assumptions of a seemingly inviolate bourgeois culture [into which the artist had been born] had seen its complacency disturbed by the destructive will to power of Twentieth Century tyrannies. The experience was transnational, but Spain in the years of the civil war [1936-39] was supremely illustrative of this determined violence. The horrors that had so preoccupied Goya were threatening to become the norm in the anti-morality of Fascism. It is in part thanks to Picasso that humanity retains its moral compass even as violence rages in the mouths of elected hypocrites of all persuasions. The importance of Guernica as a testimony is extraordinary. Aesthetically challenging and ethically uncompromising, Guernica is for many the masterwork of the modernist master. The elements that characterize Picasso are found in this work. Here is the bold imagery of anguish and conflict that sear the onlooker while fuelling the passion for justice and hope. This approach, leading to Guernica, accords with Susan Sontag’s observation that war is the norm of human history, and peace the exception. This contrasts, she avows, with the modern, humanistic view of peace as essential to the natural order of which war is an aberration. Regarding the Pain of Others may serve not only as the title of Sontag’s essay but as a major theme of Picasso’s art. The chapel of peace at Vallauris, decorated by Picasso, is perhaps awkwardly self-conscious. It is a plea against the grain of experience. Humanity is given to violence unless it is redeemed by a faith in itself which for Picasso is art. To see the Guernica exhibition in the context of Easter is poignant, for the air of Madrid is charged with an awareness of the solemnity of sacrifice and death as the streets are filled with crowds attending on the procession of Catholic iconography. There is Christ in the humiliation of his path to Calvary. There is the Queen of Heaven, resplendent in her adornments that signify hope where no hope seems possible. To dismiss this imagery as void of meaning is to ignore its power to move even a non-believer [as Picasso was] to testify against the cruelty of the world and the possibility of a better world. Art cannot offer a prescription for a better world. It cannot offer false consolation. It must take the world as it is and ask why? If that were all there should be nothing. But the dreams of art ask why not? There may be no answers out of the citadels and the temples, yet still the questions must continue to be asked. All the while great art answers its own questions.